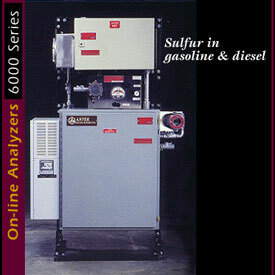 Houston, Texas: May, 2000 - 6000S On-line Total Sulfur Analyzers from Antek Industrial Instruments, Inc. quantitate sulfur in refinery streams from 1 ppm to several thousand ppm. The 6000S employs the patented, proven, matrix-independent UV fluorescent detection method described in ASTM D-5453. The California Air Resources Board (CARB) has accepted this ASTM method for low level sulfur analysis in Phase 2 Reformulated Gasolines. Additionally, ASTM D-5453 (UV fluorescent sulfur analysis) has been accepted as an equal method to the older ASTM Method D-2622 (x-ray) for higher sulfur levels. With state and federal regulations calling for lower and lower sulfur levels in many petroleum products, 6000S On-line Sulfur Analyzers provide solutions for monitoring sulfur at various stages of production and blending. Analyzers can be configured for total sulfur analysis, SO2 analysis, or total sulfur and SO2 analysis. Designed for the harsh environments of industrial and process applications, the 6000S is available in four models: NEMA 4, 19-inch rack mount, and ClassÿI Division 2 Groups C & D (explosion proof). Customizable sample preparation, sample introduction, data output, and data handling are available. With an optional Total Nitrogen Detector the analyzer performs simultaneous sulfur and nitrogen analyses. Antek Instruments, Inc., 300 Bammel Westfield Road, Houston, TX 77090. Tel: 281-580-0339; Fax: 281-580-0719.